The Department of Health consultation on imposing fixed recoverable costs in clinical negligence closes on 2nd May. AvMA and many others including other leading patients’ charities and legal organisations have serious concerns about the implications of these proposals both for access to justice for injured patients and their families, and for patient safety. If you share these concerns we urge you to respond by the deadline. You may also wish to write to your MP and/or directly to Jeremy Hunt MP, the Secretary of State for Health. 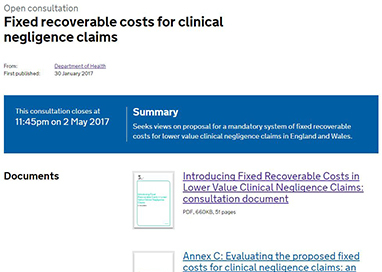 We believe these proposals, if implemented, would mean some of the most vulnerable people harmed by clinical negligence would not be able to achieve justice, because they would not be able to find solicitors to represent them, and even if they did they would lose a significant amount of their damages in legal costs that would be left to them to pay. The NHS would be less safe because it would not be held to account and learn lessons in many cases as a result. Older people’s cases, stillbirths, any fatal cases, and cases of people lacking mental capacity would be likely to be worst affected. We appreciate these would be unintended consequences, but they are realistic. We support the intention to save NHS money for use in service provision, but this must be done fairly and responsibly. Any decisions should be informed by consideration of the effect of the Legal Aid Sentencing and Punishment of Offenders Act; the results of the National Audit Office review of the NHS Litigation Authority and defendant behaviour; and protect access to justice and patient safety. At the minimum, all fatal cases and claims by people lacking capacity should be excluded from a fixed costs regime; poor defendant behaviour must be curtailed; the cap on legal costs must be at a level to realistically allow for involvement of accredited specialist solicitors; and there must be a demonstrable system for learning patient safety lessons from cases. Ideally, if the NHS were better at investigating incidents, recognising when it is at fault and made early settlement then massive amounts would be saved without the negative effects of fixed costs. You may be interested to read a blog about this by AvMA ceo Peter Walsh on the National Voices website.